There are nearly as many types of angler as there are fish swimming in the world’s lakes, rivers and oceans, but they all face one of the same challenges: You have to find the fish in order to catch them. And while this is often one of the most difficult aspects of fishing, a good sonar system – such as the Raymarine Dragonfly 4 or the 4PRO – can help make this much easier. The Raymarine Dragonfly 4DV and 4PRO are both easy to use, work well under tough fishing conditions and come jam-packed with helpful features, making them two of the best options in their respective product classes. Both include CHIRP sonar technology, Dragonfly’s patented DownVision scanning and a sharp and clear 4-inch digital screen that remains easy-to-read in all weather conditions. While the Dragonfly 4DV is intended for entry-level anglers and the Dragonfly 4PRO is better suited for more advanced fishermen, they are both built with durable materials and excellent craftsmanship to ensure they work well and are sure to last for many fishing trips to come. Thanks to this combination of features and quality, Fishing Tech gives the Raymarine Dragonfly 4DV a B- rating, while the Raymarine Dragonfly 4PRO earns an A. Both the Dragonfly 4DV and the 4Pro feature a 4.3-inch optically bonded LCD screen that is guaranteed not to fog up. The 480 x 272 screen resolution makes crisp, clear color images that are easy to see in all weather conditions. Raymarine was one of the first sonar manufacturers to make CHIRP technology – which relies on a variety of simultaneous sonar frequencies to provide exquisite detail -- widely available at relatively low price points. Both models are equipped with Raymarine’s CHIRP DownVisionTM imaging, which sweeps a broad band of the water below, and is effective down to 600 feet. Both models feature the same ball-in-socket mounting bracket, which is easy to install in a variety of places on most boats and kayaks. Additionally, this design makes it easy to adjust the display quickly, so that you can see it from just about any angle necessary. There are also a few differences between the two units, as the Dragonfly 4DV is intended as an entry-level fish finder. The Dragonfly 4PRO is packed with the kinds of features advanced anglers demand. The biggest difference between the two units is dual-channel functionality. The Dragonfly 4DV only comes equipped with a single sonar channel (CHIRP DownVisionTM), while the Dragonfly 4PRO also features a traditional (conical) CHIRP sonar channel. You can view either channel individually, or you can monitor both sonar channels simultaneously, with the split-screen function. Raymarine WiFish App compatibility (compatible with both Android and iOS systems) enables you to view information from the fish finder on your smart phone or tablet. You can even view different data than is displayed on the 4PRO screen, and use pause, rewind and zoom functions. Save-and-share screenshot function enables you to share information with other anglers, whether you are still on the boat, or you’ve already returned home from a day on the water. Built-in GPS circuit and Navionics chart compatibility help you search any body of water quickly, easily and efficiently. And once you find a productive honey hole, you are guaranteed of being able to find it again. The 4PRO features a micro SD card reader giving you the chance to upload additional files and software packages in the future. The Dragonfly 4DV’s CHIRP DownVisionTM sonar circuit has a 600-foot depth range, while the traditional CHIRP sonar circuit of the Dragonfly 4PRO provides clear images down to 900 feet. Because both Dragonfly models use CHIRP sonar technology, they provide exquisite detail, previously unavailable in consumer-level fish finders. This makes it easy for you to distinguish between things like baitfish schools and brush piles. In fact, it is often possible to identify the fish seen on the screen and even visualize their bodies, tails and direction of orientation. Most anglers will find the controls and menu system of Raymarine’s Dragonfly lineup easy to use and navigate. The simple, 5-button interface is easy to use whether you are wearing gloves, your hands are wet or you are trying to multitask. In addition to the combination power-screen-brightness button, the Dragonfly features two buttons for zooming in or out. It also has a multi-direction control pad for navigating around the screens and a back button that allows you to return to a previous screen. The Dragonfly features an all-in-one cable that connects to the back of the unit. A simple twist-lock keeps the cable connected, and makes it easy to disconnect the main unit from your boat when you need to. Although the screens used on the Dragonfly 4DV and the 4PRO are not gigantic, they provide high-quality color images. These are easy to see, no matter the weather conditions. There are several different view modes you can use to analyze the data collected by the transducer, and the flexible mounting bracket allows you to point the display in the most appropriate direction for your current needs. It is always important to analyze fish finders in comparison to other models that are available. This includes both those produced by the same manufacturer, as well as those produced by others. The Dragonfly 4DV is Raymarine’s most affordably priced option. 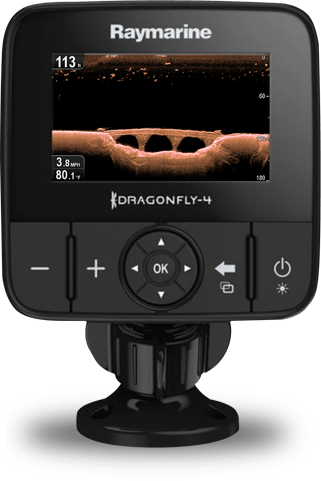 Although it does feature CHIRP DownVisionTM technology that provides a detailed image, it does not include the traditional CHIRP sonar circuit that most other Dragonfly models do. It also lacks some of the bells-and-whistles that other products in the Dragonfly line do, such as a built-in GPS and Navionics chart compatibility. By contrast, the Dragonfly 4PRO is geared toward more advanced anglers, who demand more features and greater flexibility from their fish finders. The Dragonfly 4PRO comes equipped with the same capabilities that all of the Dragonfly 5 and Dragonfly 7 models do, and the only real differences are screen size, screen resolution and cost. The Dragonfly 4DV compares with other entry-level sonar units, such as the LOWRANCE Hook 4x and the Garmin Striker 4cv. Like the Dragonfly 4DV, the LOWRANCE Hook 4x uses only one type of sonar circuit; Dragonfly relies on the trademarked DownVisionTM, while the Lowrance only uses traditional sonar. The Garmin Striker is somewhat unique for models at this price range, as it utilizes both a traditional sonar and down-imaging sonar circuit. However, the Garmin display screen is smaller than those of both the LOWRANCE and Raymarine models, and lacks the display quality these other sonars possess. The Dragonfly 4PRO is most similar to other mid-level fish finders, such as the Humminbird Helix 5 and the LOWRANCE Elite 4. All three units use dual sonar circuits and rely on CHIRP technology to provide the most detailed image possible. The Humminbird Helix 5 has a larger screen than either the Dragonfly 4PRO or the LOWRANCE Elite 4. All three work as a GPS unit in addition to a fish finder, and come equipped with plenty of maps to help you find your way. The Humminbird model probably provides a better screen image than the Dragonfly model, while the LOWRANCE model provides the poorest image of the three. For those seeking a high-quality, entry-level fish finder, the Dragonfly 4DV is hard to beat. Experienced anglers will undoubtedly find that it lacks the functionality they require, but for those looking for a first fish finder, the Dragonfly 4DV is a great choice. It is very easy to use, won’t require you to make constant sonar adjustments and features CHIRP technology to provide you with detailed images of the water below. By contrast, the Dragonfly 4PRO is an excellent choice for anglers who have already spent some time using an entry-level unit and are ready for a fish finder that features dual sonar circuits, mapping functions and Wi-Fi capabilities. The Dragonfly 4PRO screen is probably a bit too small for professional anglers and charter captains, but it provides plenty of value to weekend anglers and kayakers, for whom space is often limited.